1st Annual “Language Hotspots Workshop” Success! The Living Tongues Institute for Endangered Languages held the first annual “Language Hotspots Workshop” from July 11th to 14th, 2011 at the Center for Ancient Studies at Willamette University in Salem, Oregon. 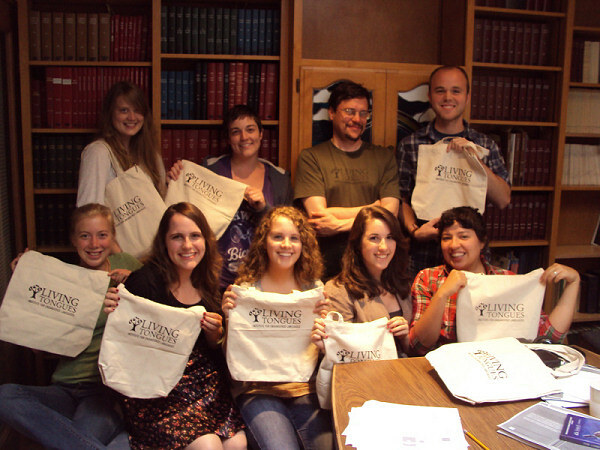 Ten young scholars from various colleges around the country attended the workshop held at the Center for Ancient Studies and Archaeology at Willamette University http://www.willamette.edu/centers/casa/. The workshop was facilitated by Living Tongues Director Dr. Gregory DS Anderson and Organizational Fellow Anna Luisa Daigneault. The workshop participants were all Living Tongues volunteer researchers currently working on the Language Hotspots Database Project, an ongoing collaborative digital project that is compiling the latest linguistic, anthropological and topographic data on endangered languages to create an innovative online research tool that will be used by scholars as well as speakers of endangered languages. The volunteer researchers are: Natalie Feingold, Eleanor Pollo, Tanager, Erik Joel West, Rachel Eidson, Victoria Osborne, Claire Fallat, Emmy Haskett and Living Tongues intern Cameron French. Data management expert Kimberly Gladman was also involved via Skype. Students represented such schools as University of Oregon, Willamette University, University of the Pacific, Evergreen State University, University of Melbourne, and University of North Carolina-Chapel Hill. The goal of the event was to inform the participants about the latest research concerning Language Hotspots, specific areas of the world where many endangered languages are clustered. These hotspots exhibit high levels of linguistic diversity as well as high levels of endangerment. Language Hotspots also contain languages that are under-documented, meaning that they lack formal linguistic documentation and language tools such as texts, dictionaries, descriptive grammars and audio-visual materials, which are important for systematic conservation and revitalization efforts by future generations. This workshop was a platform for participants to learn more about the distribution of Language Hotspots around the world. On Day 1, they learned about the analytical aspects of the model, and focused on recent Living Tongues fieldwork that took place in Eastern Melanesia. Day 2 focused on Database Quality Control methodology, as well as linguistic fieldwork in Siberia. Day 3 focused on the endangered languages of the Americas, and Day 4 was devoted to learning about phonetics and doing linguistic transcription exercises involving many languages located in the Language Hotspots around he world. The workshop was a great success and all the participants left in high spirits, and will also continue to contribute the first Language Hotspots Database. They each received a Living Tongues silk-screened canvas tote bag (see picture below). This entry was posted in Gregory D. S. Anderson, Language Hotspots, Launches and Public Events, Support Endangered Languages, Workshops and tagged Dr. Gregory D. S. Anderson, Dr. K. David Harrison, endangered languages, Language Hotspots, living tongues institute, oregon, salem, The Linguists, volunteers, workshop by livingtongues. Bookmark the permalink.